Last Saturday, I decided to break my usual morning run routine by heading out to a venue I had never been to before, to meet a group of people whom I barely knew: the Larian 40 Taman runners. I had been observing the group online for a while but never got around to joining them. I went this time since the park Zul – the head honcho for the running community project who also happens to be a TV host – picked was relatively near to where I lived. Plus I have always been intrigued by the concept and objective of the project. 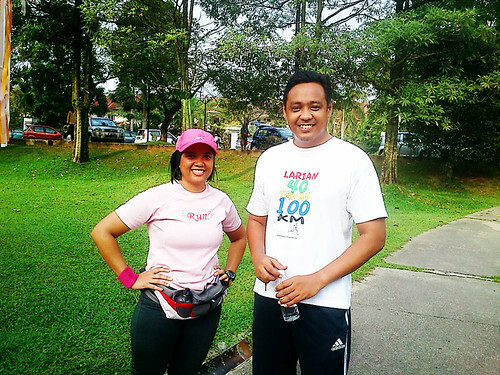 Larian 40 Taman 100 km is basically a mini project that Zul embarked on to celebrate turning 40 this year. The plan was simple: he calls for runners from all levels to come meet, run and enjoy 40 handpicked parks, totaling a distance of 100km. Not only was Zul promoting running for better health and fitness, he was also aiming to raise awareness amongst Malaysians about the many beautiful recreational parks we are so blessed to have. So far Larian 40 Taman has ran 13 other parks including Kelana Jaya, the park next to the Petronas Twin Towers, Taman Jaya next to Ampcorp Mall PJ, and the iconic Taman Titiwangsa in KL. 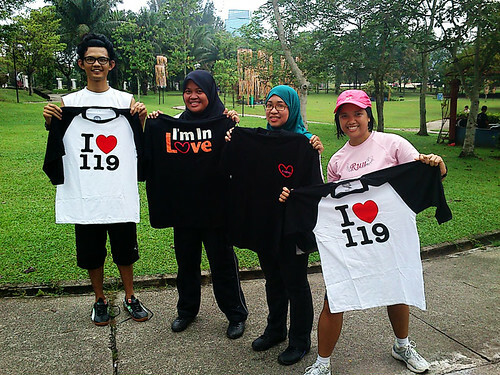 Central Park in Bandar Utama was run #14. I got there earlier than the agreed congregation time of 7.30am. I couldn’t see any sizable group of runners yet, and for a while I thought maybe I had read the day wrong and that they had planned to run on a Sunday instead. So I went on to run the rather small park that is situated right next to the New Wing of 1Utama shopping mall. Nestled in the middle of the park and on the edge of the dizzying pathways were two small manmade lakes (or should I say, big ponds?) with absolutely no barrier around them. I made a note to mind my steps more vigilantly so as to not trip; I didn’t want to end up doing a triathlon instead! Going one round around the park felt short as I was more used to bigger loops at the park where I normally ran. The running path was also a lot narrower. Later I learned one loop around the park was actually about 600m in length. As the morning sun rose I also felt the heat coming on to me a lot harsher than my regular park where the landscape is almost literally a forest. I attributed Central Park’s heat factor to two main reasons: the park had lesser trees to provide shade, and the park was smack in the middle of a busy neighborhood next to an even busier highway with more cars belching out exhaust waste. As soon as I completed 2km, I noticed a small group of about 10 people standing rather idly at the car park area. That could be them, I thought, so I diverted from the running path and trotted over to say hello. I recognized Zul from his Twitter avatar, and upon seeing me he said “You’re the one that tweeted me, right?” I nodded with a smile, and said good morning to the group, to which they murmured a greeting in response. Since there was no signs of more people joining us, we proceeded to do some warm ups, led by a veteran runner in the group. And then we were off. I was in front of the small pack, running alongside Zul and having small talks about his project, his last running event at FRIM and a bunch of other stuff. We even zipped through a group of tai chi exercisers who were busy ‘pushing air’ (that’s how small the park was). Zul and I ran 2 loops before he decided to slow down to take pictures of the other participants. That was when I ran beside Lotfi, a lady with an exemplary attitude about running. 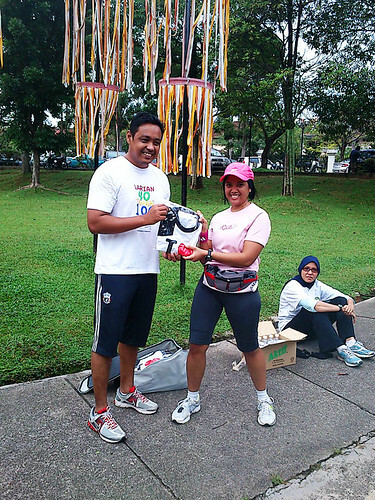 She had told me she was joining the Energizer Night Race in Sepang that night, the 5km category to be exact. I applauded her for being able to join in; I missed out on registering for ENR this year because the number of runners allowed in the F1 international circuit had been greatly reduced, so the signup time window was shorter. After 2.5km the Larian 40 Taman runners decided to stop, and so I played by their time and ceased my pavement pounding too. At that point I had already clocked in 4.5km, a nice and easy run. Then Zul gave out some t-shirts courtesy of the TV station where he worked, so I scored a baseball jersey-type shirt whilst the other runners picked out t-shirts brandishing movie titles I was not familiar with. It doesn’t take a genius to figure out that I don’t watch much local TV or read much local entertainment news. It was also during this gift-giving session that a friendly young woman named Normi approached me and asked if I was Fairy. When I said yes, she gushed and said she used to follow my writings on myindo.com, back when she was into Sheila on 7 and other Indonesian music acts. A little bit bemused, I remembered my manners and thanked her for her support. Since I have not updated my Malaysian-Indonesianist-themed website in literally years, I’m surprised but flattered someone still remembered the things I’ve put up there. With Central Park BU crossed out on his list, Zul now has to think about running at another 27 parks to complete his goal of 40. We gave out ideas about other places he could consider having Larian 40 Taman at, since he jokingly stated that he worried about running out of parks (pun intended!). With so many neighbourhoods in the Klang Valley and beyond, I didn’t think this would be the case. All in all, I am pleased that I decided to do something different that Saturday morning – running with a bunch of like-minded strangers at a place that I would have most likely not given a thought about running at. I wish Zul and all current and future Larian 40 Taman runners good luck in achieving parks #15-40 – and who knows, I may join them in a park or two again. Zul handing me a jersey. Lotfi is seen sitting in the background. Me and a few others (Normi is 2nd from the left – thanks for saying hi!). 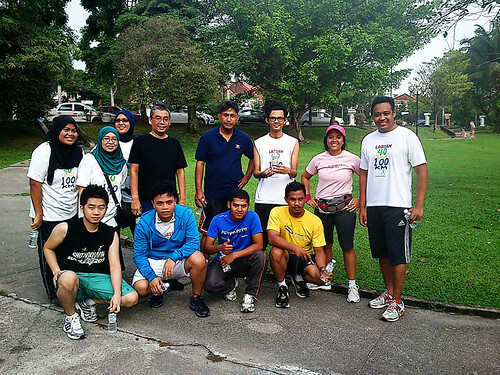 @Larian40Taman @aleffush Terima kasih! Lookin’ good! @myindodotcom @aleffush hope to see u guys more often! @creepy_witch Does Indonesia not have any nice parks? @myindodotcom well, not much around Bogor, except for the Botanical Garden. @creepy_witch That is a rather nice and lush place to run at too. 🙂 What about Jakarta, any good ones? I keep hearing Senen.